This image shows a very early (ugly) prototype of the next version of my Android football game. The orange boxes on the bottom-left let you choose the formation, then the “run,” “pass,” and “other” icons stand for tabs that let you choose different plays. I may put the formations inside a tab as well ... that would be more consistent, and it will be something I’ll need to do as the game grows. A major new feature in the game is that you can can create your own custom teams, with each player on the team having a collection of ratings. For instance, a running back will have rating categories of a) running, b) blocking, and c) pass-catching abilities. 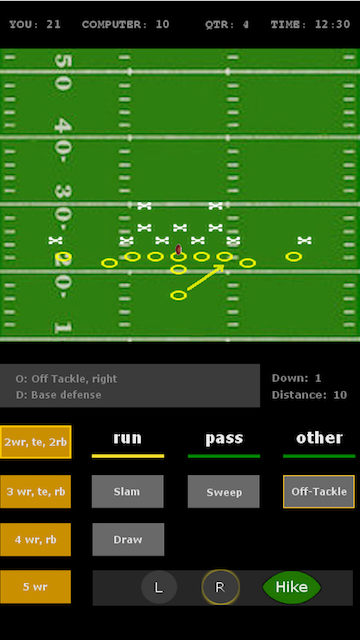 Therefore, the running plays will let you choose to run left or right, and passing plays will let you choose the intended receiver. I’ll write more as time goes on, but this ugly little prototype is one of the first steps in the redesign/upgrade.